The Edge Of Desire by Tuhin A. Sinha. Audience/Genre : Adult/Crime, Political Fiction. Publication : May 15th 2012 by Hachette India. When journalist Shruti Ranjan, newly-wed wife of the Deputy Commissioner of Kishanganj in the lawless Bihar of the 1990s, is brutally raped by a ‘politically sheltered local goon’ all of her attempts at getting justice are crushed by a corrupt and complicit state government. That’s when the charismatic Sharad Malviya, a leading member of the Opposition party, offers her an unlikely solution: his party’s ticket to contest the Lok Sabha elections. Left with little to choose from, Shruti agrees, only to realize that being catapulted to an enviable position of power in an all-man’s world comes at a price. Caught between her mentor and her spouse – both upright but ultimately flawed men – and a host of envious others who continue to cast aspersions on her character, she struggles to address the larger problems of the country. Thanks to Hachette India for providing me a Review Copy. Heads Up : This is going to be one of my longest reviews ever. Anyone who knows me would know that I don't read much of Indian writing, not because I have something against it (which obviously, I don't) but more because I can't relate to the writing style. However, after reading the synopsis, I started reading The Edge Of Desire, not just with an open mind but also with a lot of interest because the plot seemed to be deep and powerful. Let me begin with this - Tuhin Sinha's writing is nothing like the stuff I've read before by Indian writers. It's simple and concise and sometimes, that makes for the best kind of story telling, like it does this book. His to-the-point writing style gave the protagonist - Shruti Ranjan - 's voice an added strength that leads you to both understand and admire her. Shruti is an ex-journalist from Delhi who, after finding her boyfriend in bed with her best friend, moves back to her hometown to live with her parents. Due constant pressure from her parents, Shruti caves in and agrees to an arranged marriage to Rohit, Deputy Commissioner of Kishanganj; a town in Bihar that's not ruled by the Government but instead thugs, with the local government authorities helping them. This marriage and move leads to the most traumatic event of Shruti's life, one that eventually ends in her taking a completely different direction/journey than the one she imagined. The Edge of Desire is a book that explores almost every form of sin and corruption that exists in India and it's legal system. I'm from India and I've lived in my own protected bubble but even I know that politics can get down right dirty in my country and it's best to stay clear of it. I can't put my thoughts completely in words about this book. I felt a whole range of emotions - sadness, anger, frustration, more anger, betrayal and anger again. The sad thing is, you read about things like this in the paper all the time and you feel sorry for the girl - someone you don't know -and that's it. That's as far as you feel about these issues but when you read a book, it's a completely different experience. You get to know the character, understand her and feel a sense of loyalty. That makes reading/hearing/seeing the things happen from her point of view so much harder to deal with. Well, at least, it's what happened to me while reading this. With The Edge Of Desire, Tuhin Sinha has created vivid characters and a violet, powerful plot that will definitely affect all its readers. I should warn you, it's not for the faint of heart because the author isn't afraid to get to the dark and gritty places and that's what makes it literally unputdownable. I actually felt pained when I read about what was happening to Shruti. There were characters I absolutely hated but I have to hand it to the author for evoking such strong emotions in me just through his words. 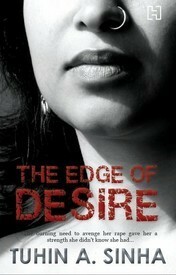 If you think you can handle it, get yourself a copy of The Edge of Desire right away! Whoa. You read really fast. It was just a day or two ago that you got this book ;) Great review! :D But I don't think it's my cup of tea. I rarely read adult. Yeah I get it, it's not my usual type either but it was good.